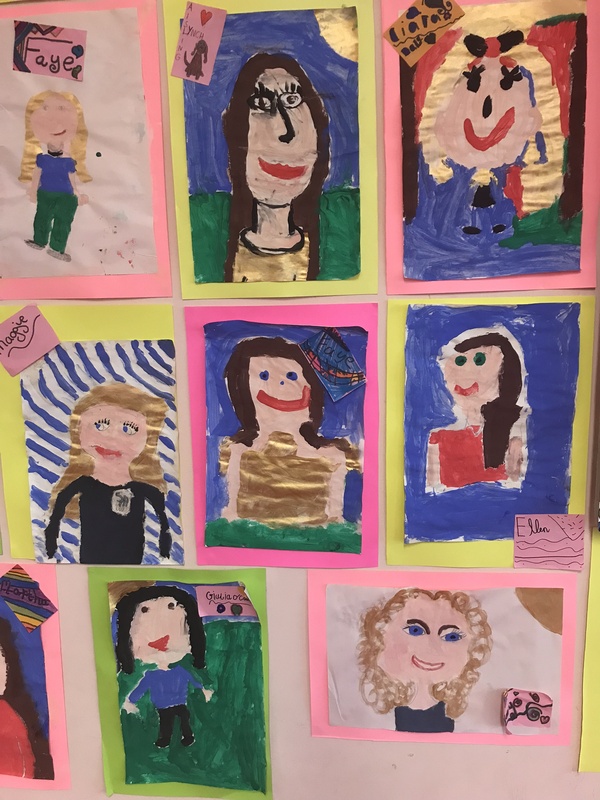 During September we focused on the Painting and Colour strand in Art. 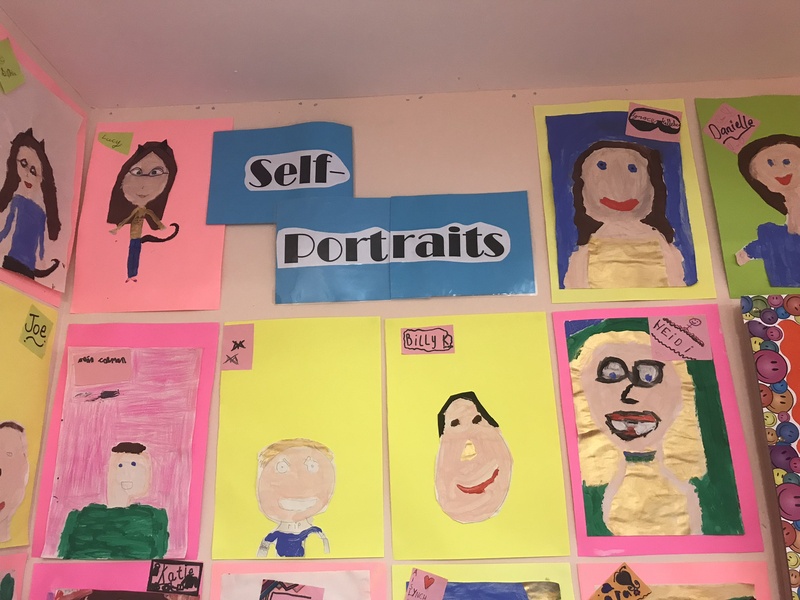 The children looked at and discussed the work of famous painters such as Picasso, Frida Kahlo and Van Gogh before painting their own self-portraits. 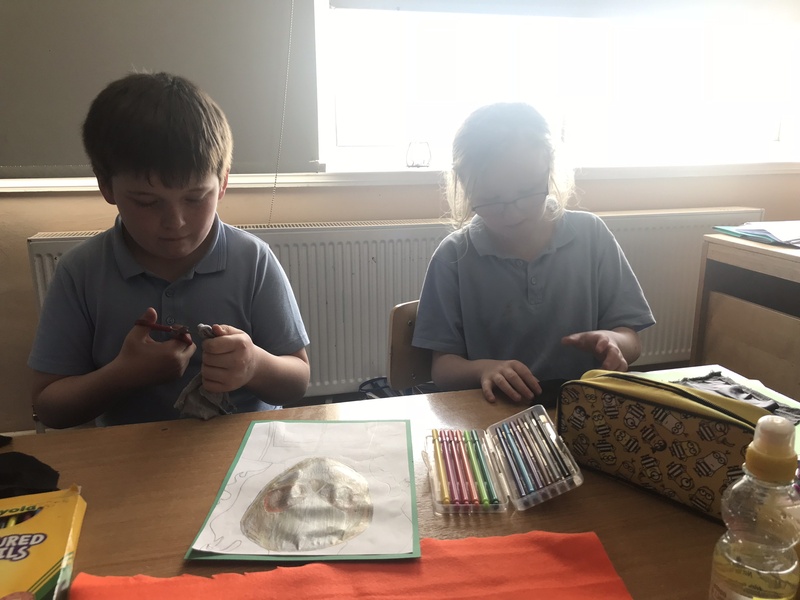 We then examined the technique of Pointillism, looking at the work of artists Georges Seraut and Paul Signac. 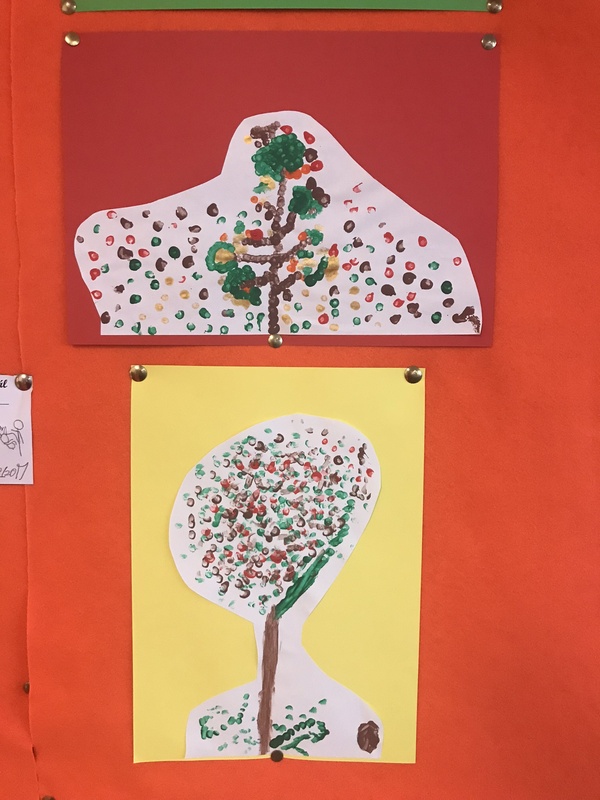 An Autumn walk around the school grounds further inspired the children and we decided on an Autumn theme for our Pointillist paintings. 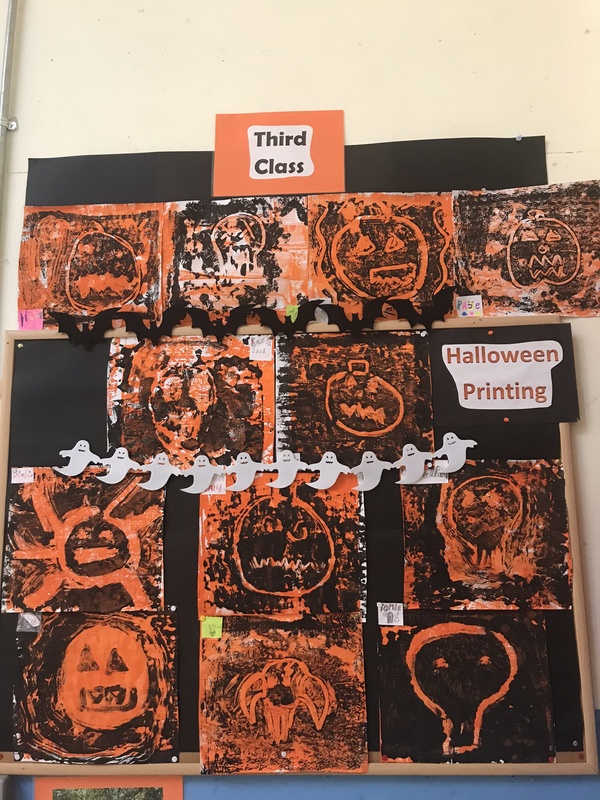 In October we explored the Print strand of the curriculum. 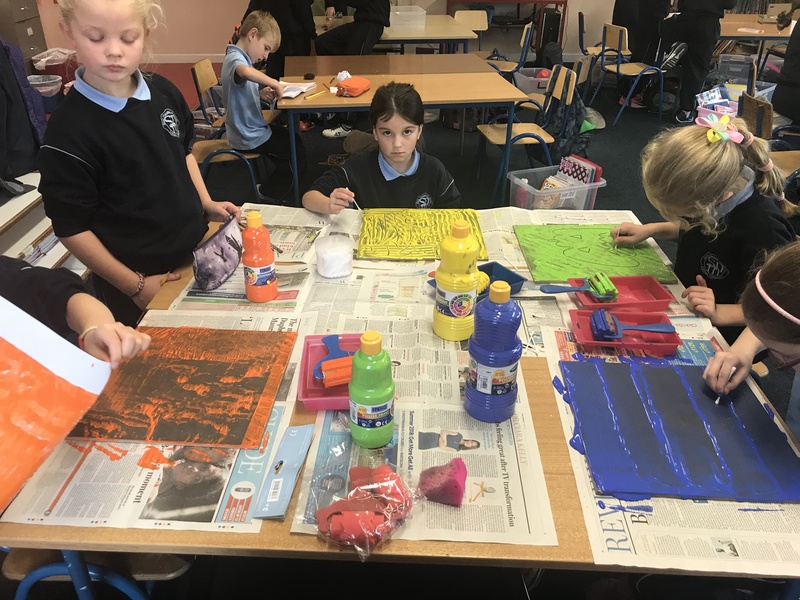 We began by doing simple mono-prints, applying paint to tiles, creating a picture using cotton buds and placing a page on top. 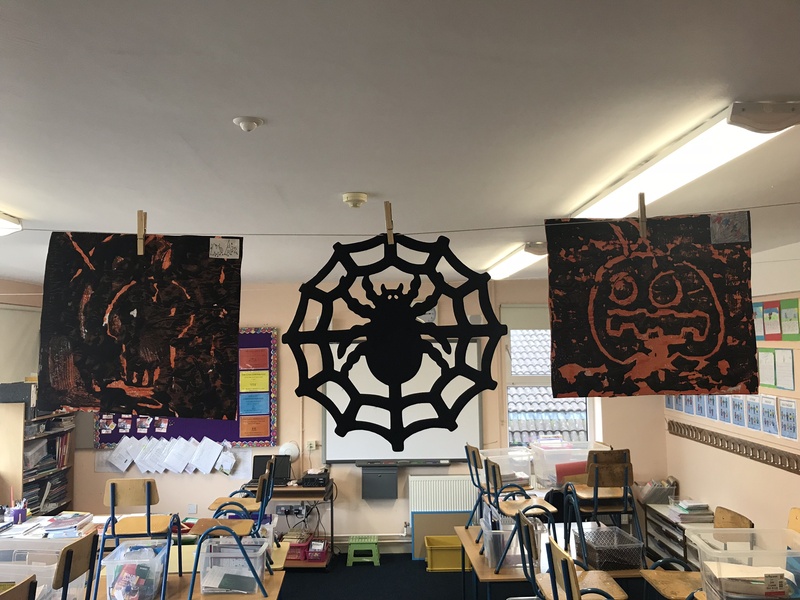 We further explored the technique and created spooky Halloween pictures by overlaying black paint on top of orange in a two stage process. 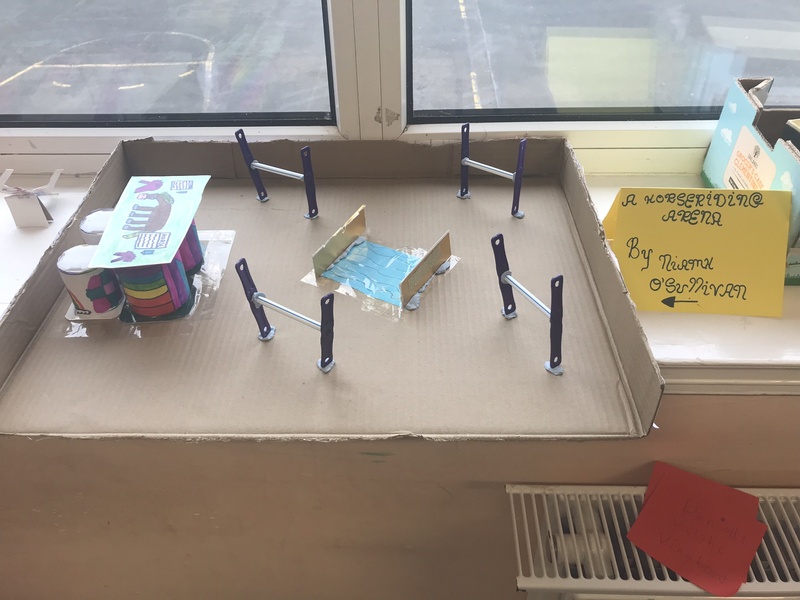 We learned a lot during this process through trial and error. 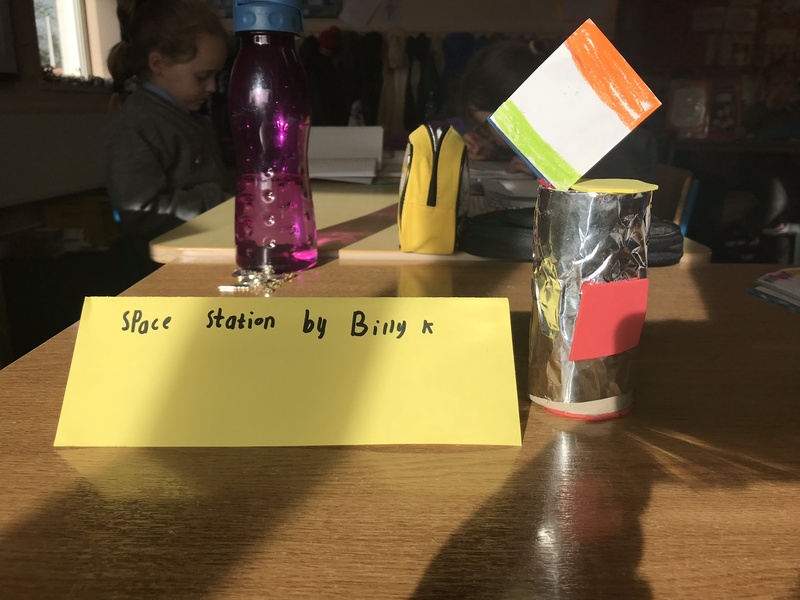 We worked on the Drawing strand in November. 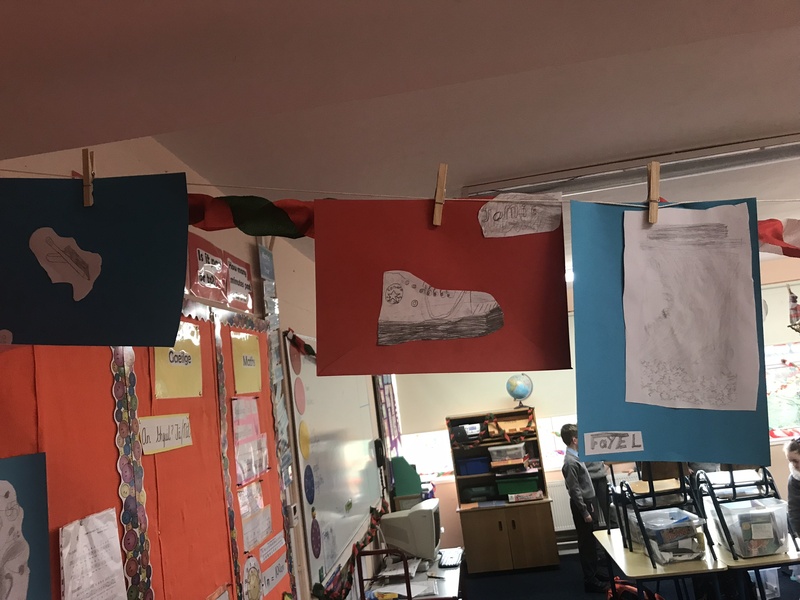 We talked a lot about light, shade and lines at first and tried to observe these in the environment. 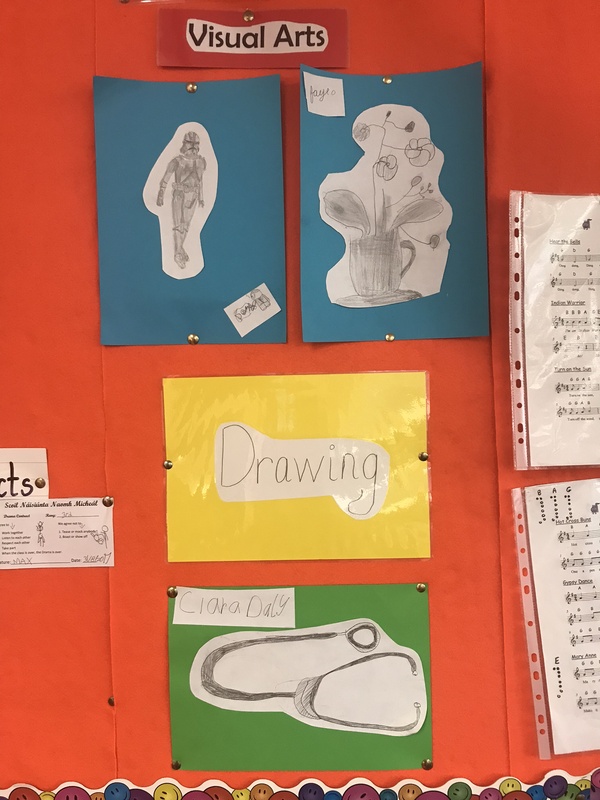 The children tried out different media and styles of drawing and experimented with incorporating different types of line into their drawings. 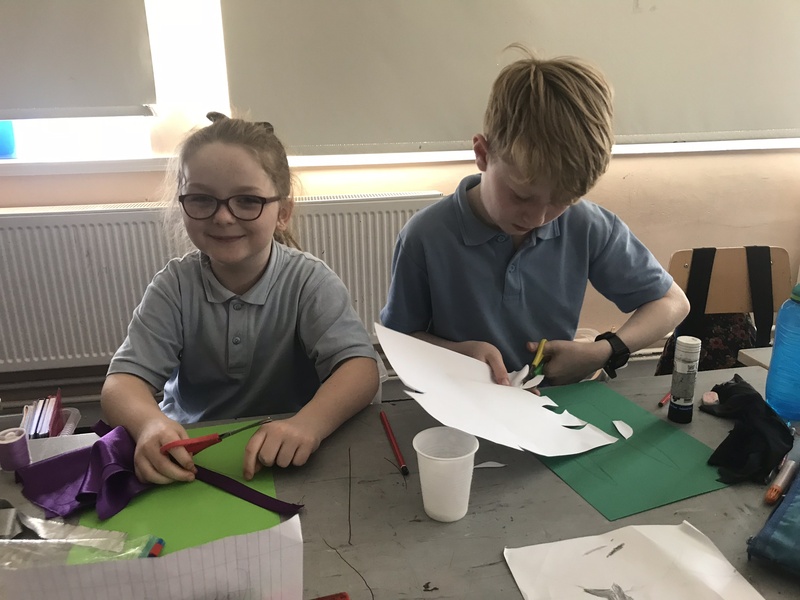 They then drew imaginative pictures using chalks or pencils. 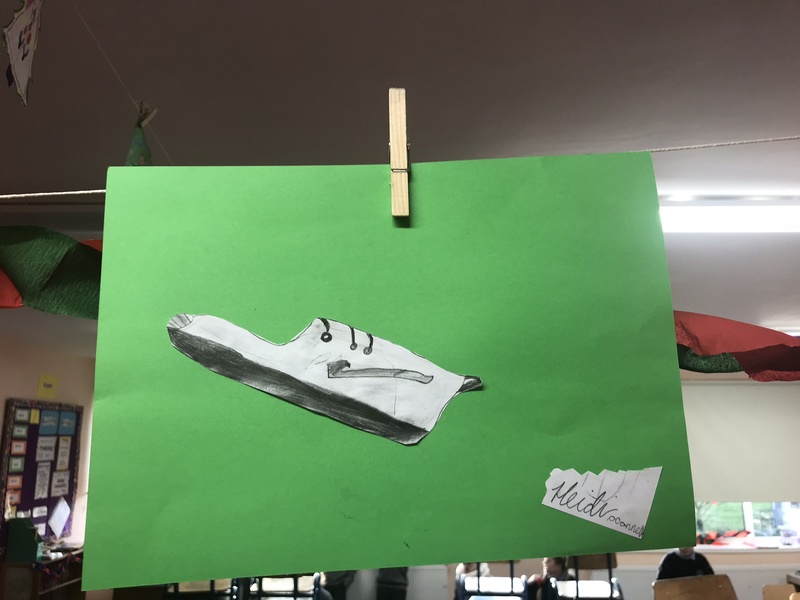 Next, we looked at some still life drawings online, paying particular attention to how the artists created light and shade. 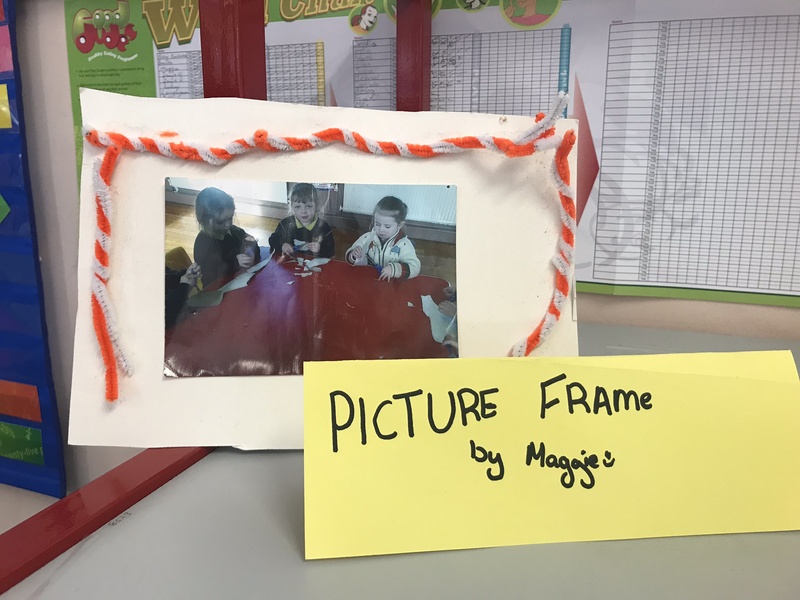 The children chose objects from home or the classroom to complete their own still life drawings. 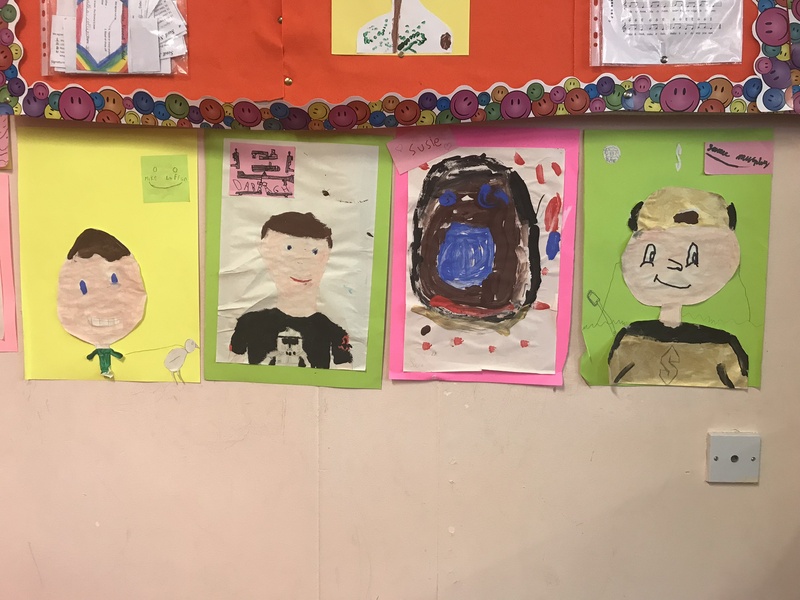 See some of their drawings below. 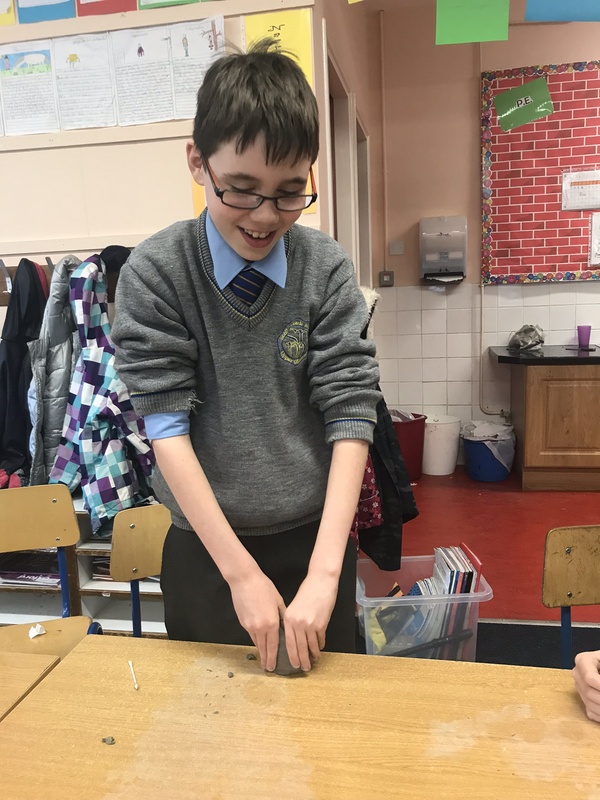 In January we started the Construction strand. 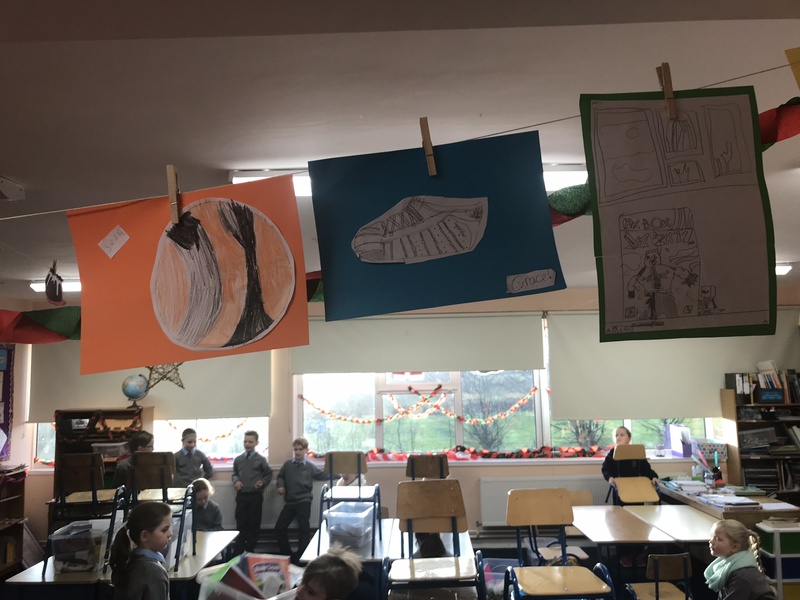 Some time was spent coming up with ideas and sharing them with the class. 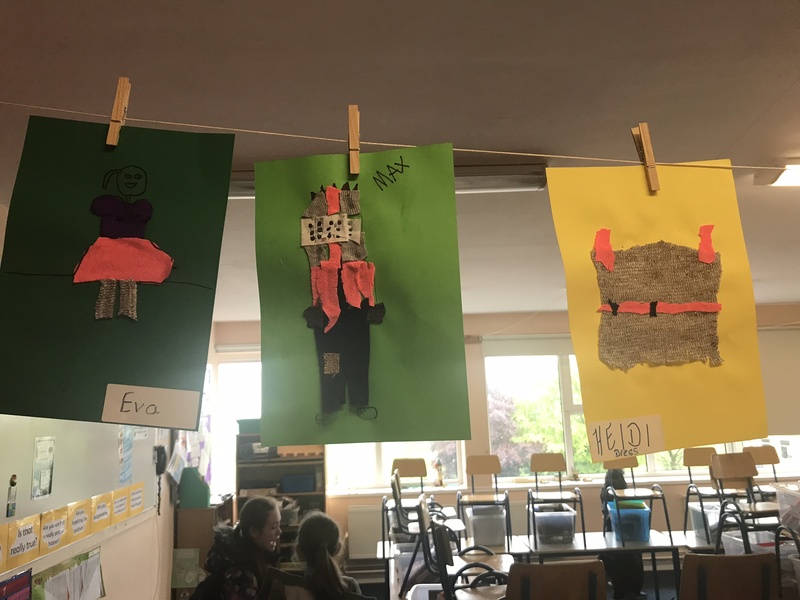 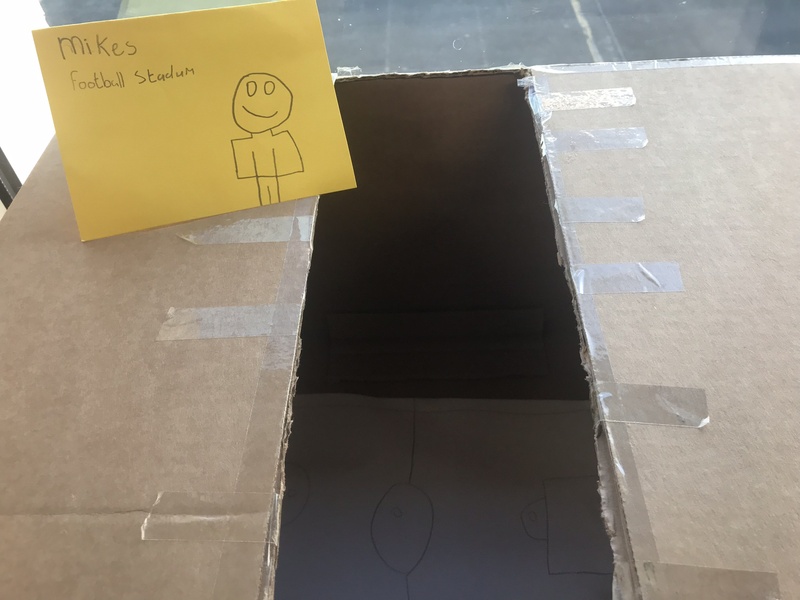 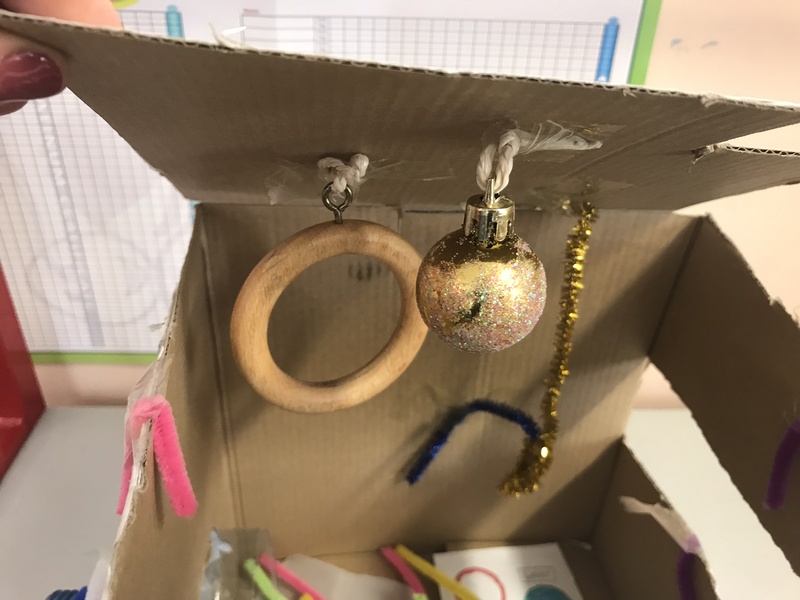 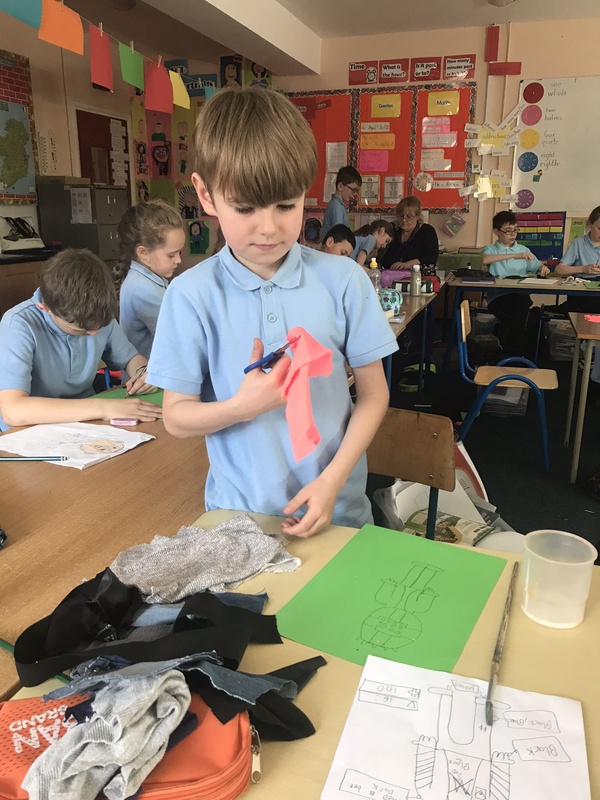 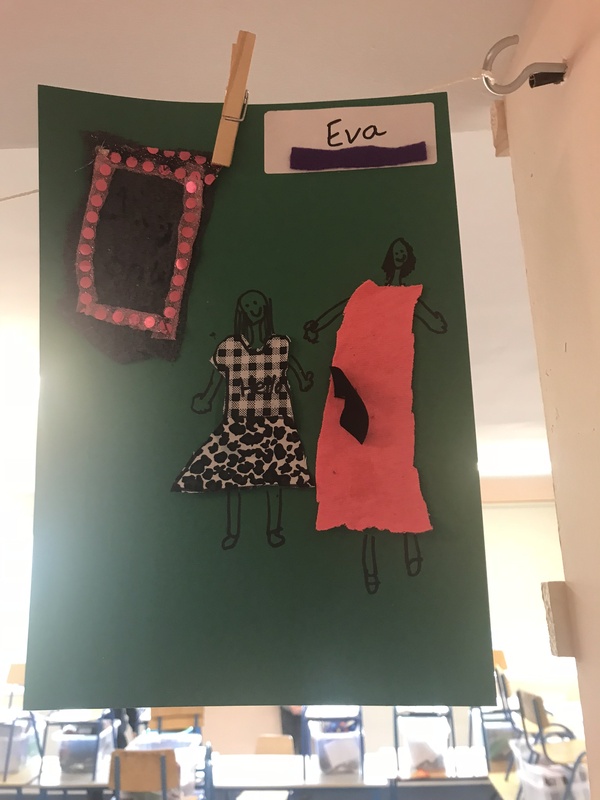 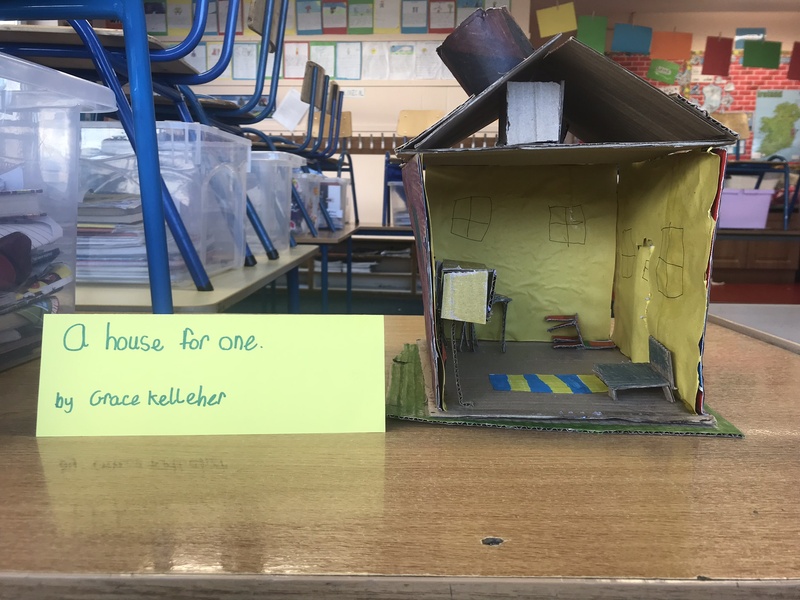 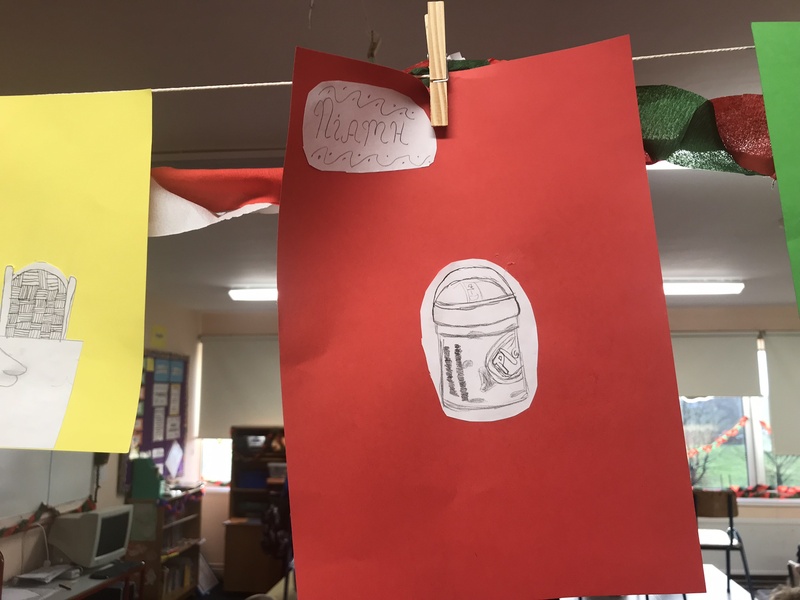 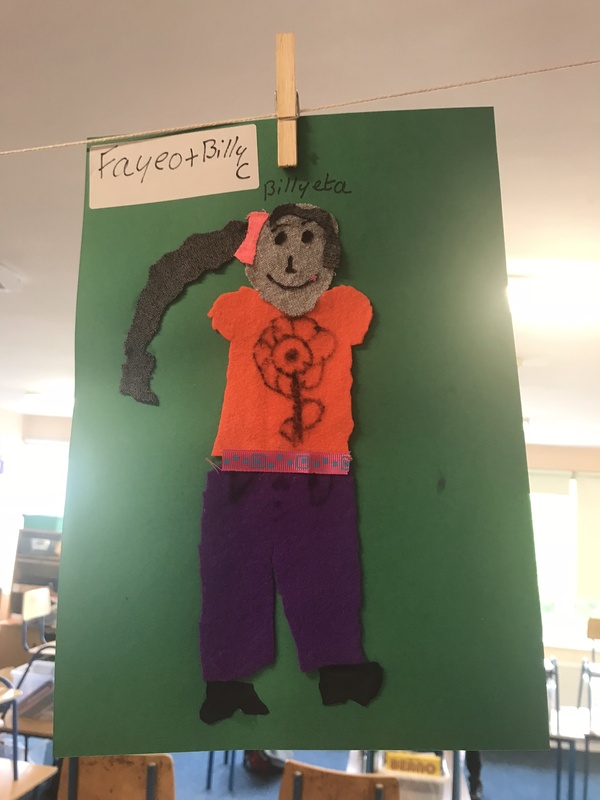 When they were ready, the children drew up plans of their models, paying particular attention to what materials they were going to use and how to create a robust structure. 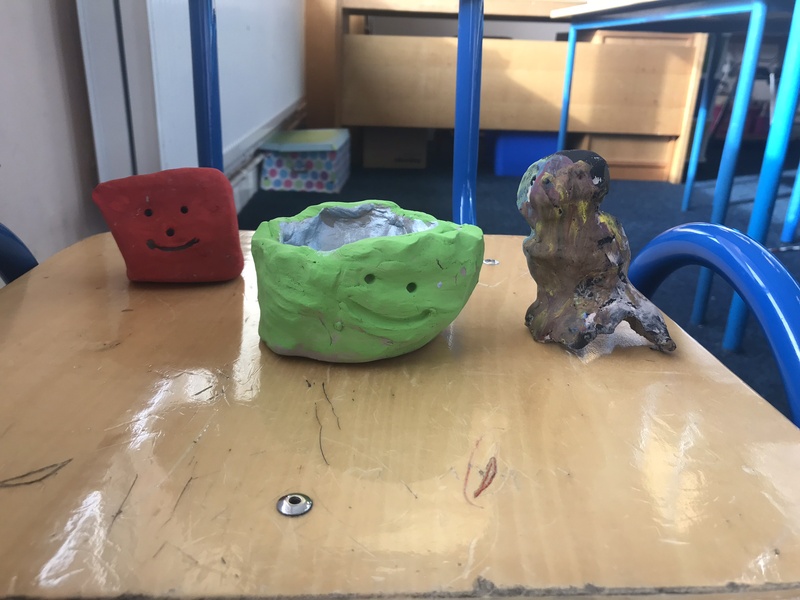 They then gathered all the materials needed for their creations. 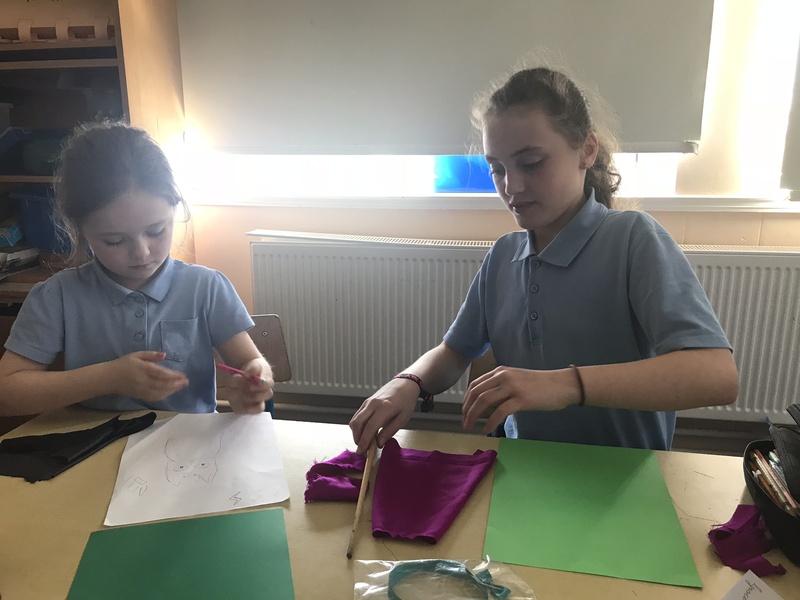 Many of the children helped each other out by collecting things for their friends. 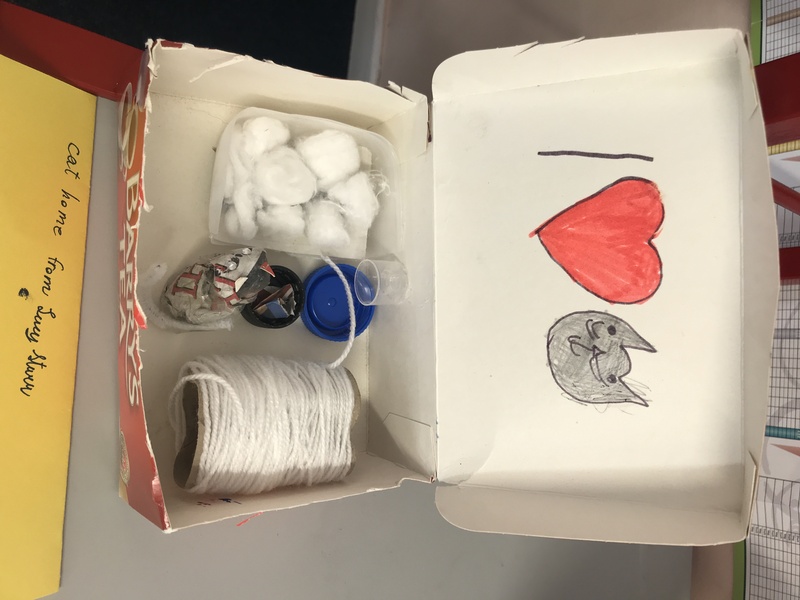 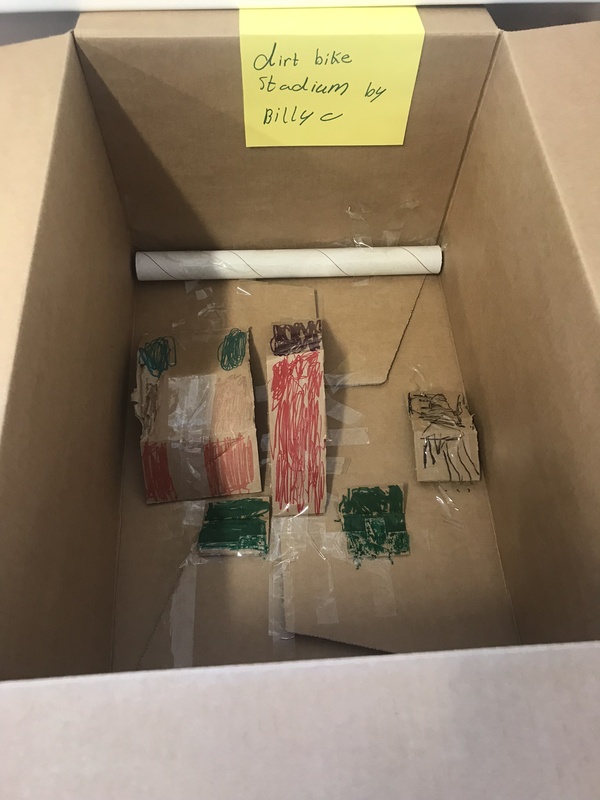 The materials used were packaging, paper and cardboard. 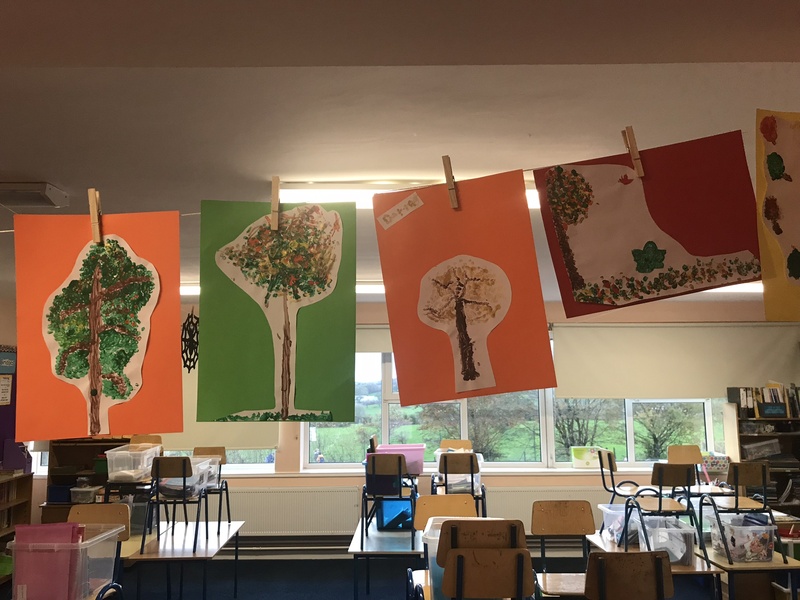 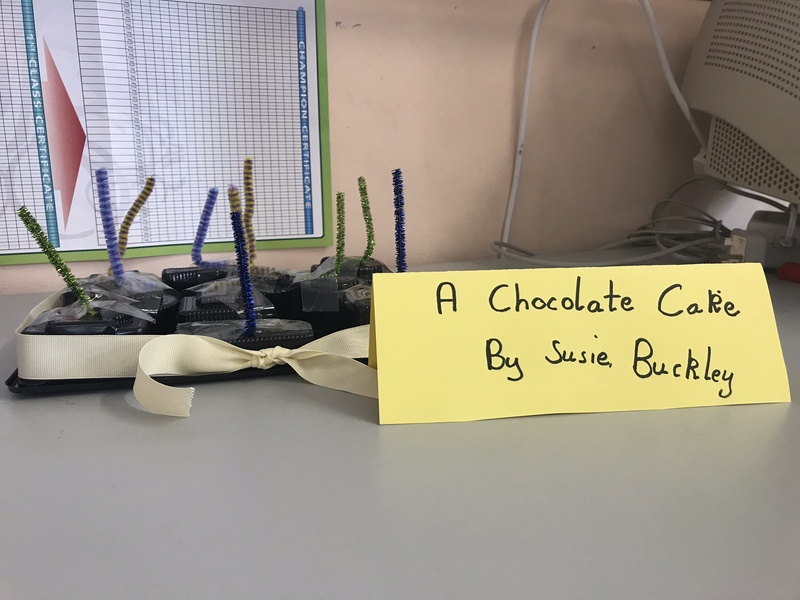 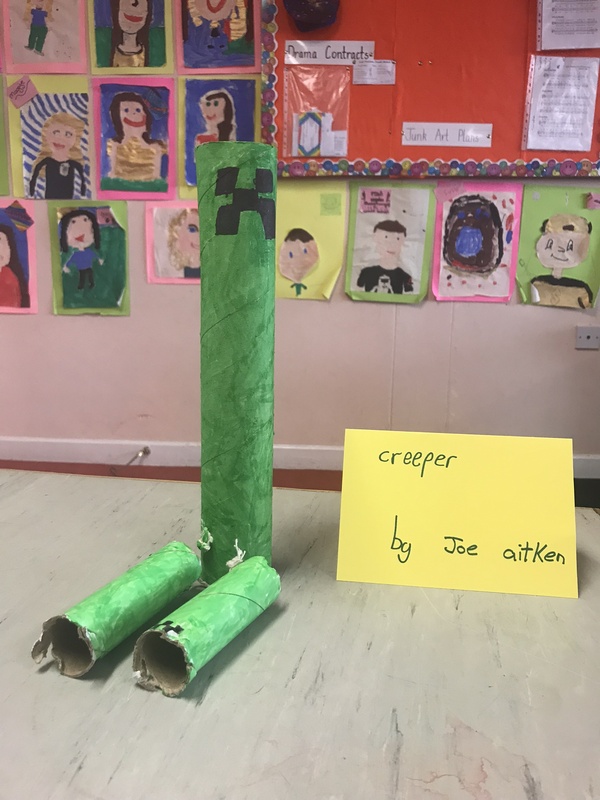 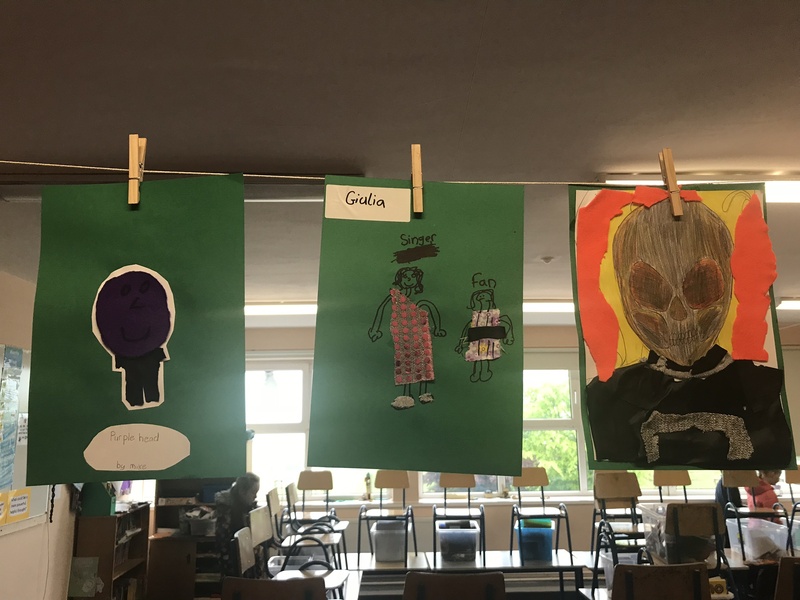 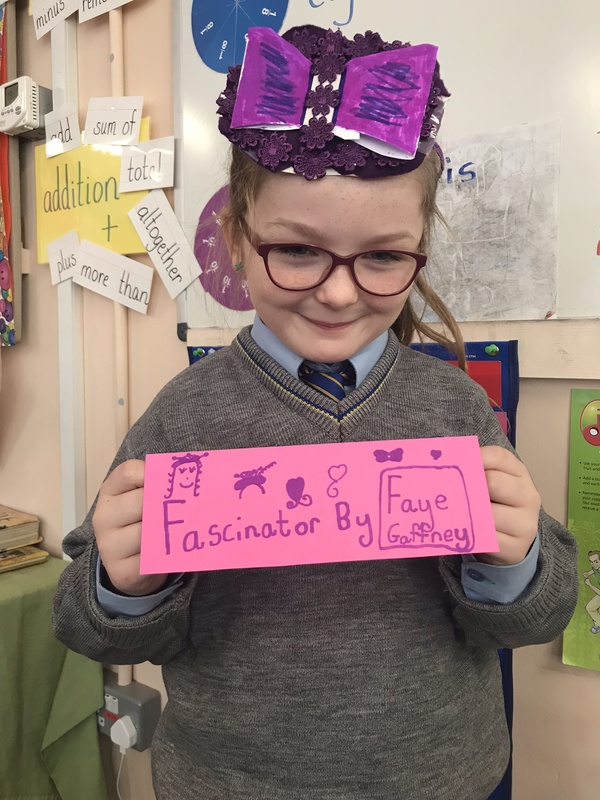 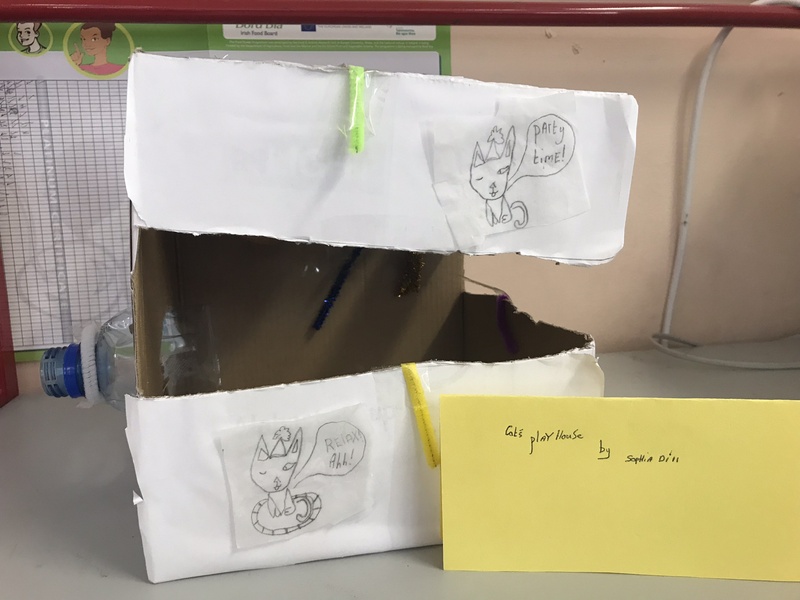 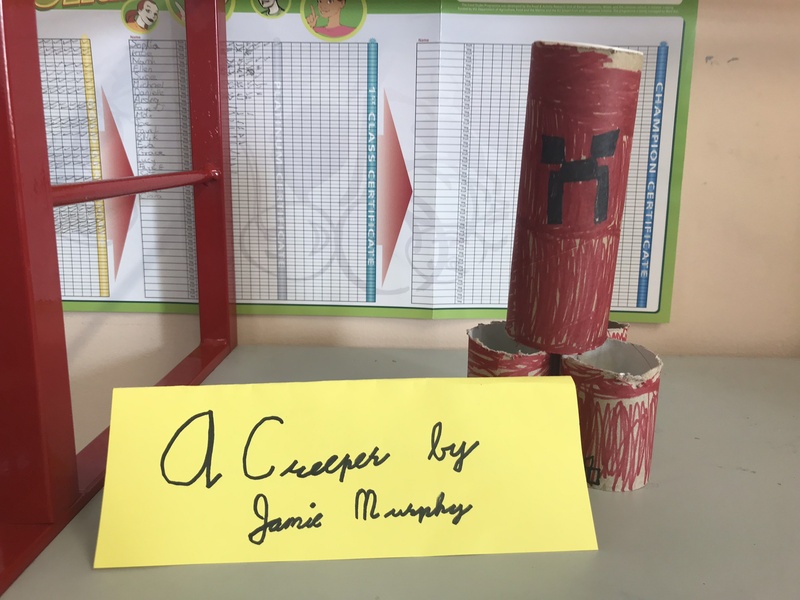 The children also drew on their experiences of creating “Junk Art” in Junior and Senior Infants when coming up with interesting materials to use . 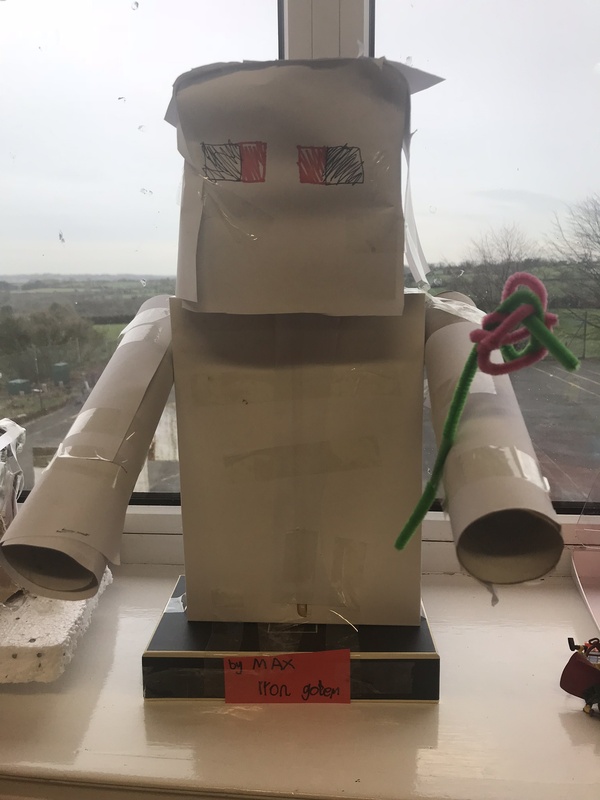 While half of the class worked on building their structures, the other class made a variety of Lego models. 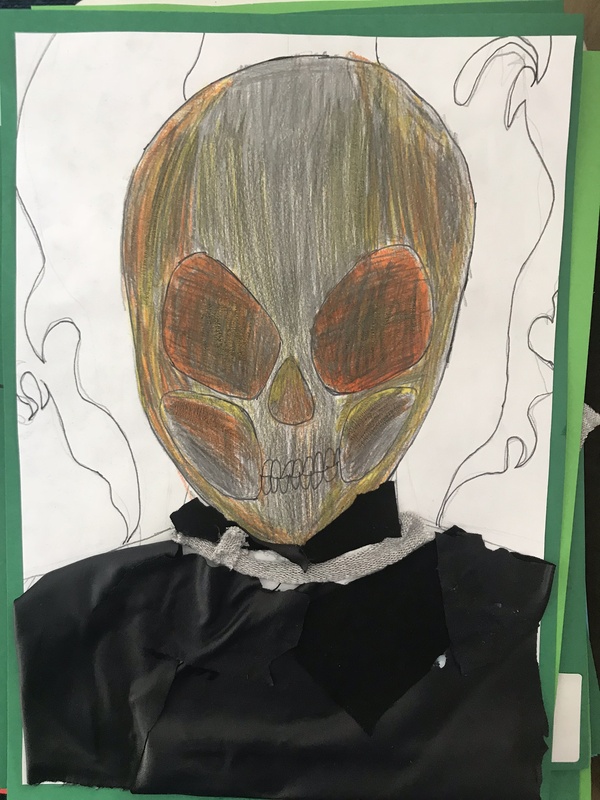 The following week, the groups switched. 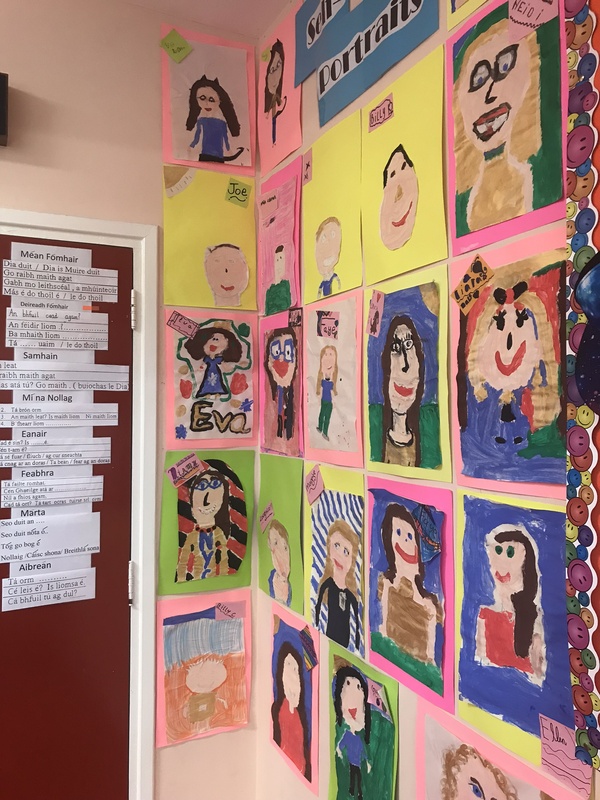 When the pieces were finished they were displayed in the classroom. 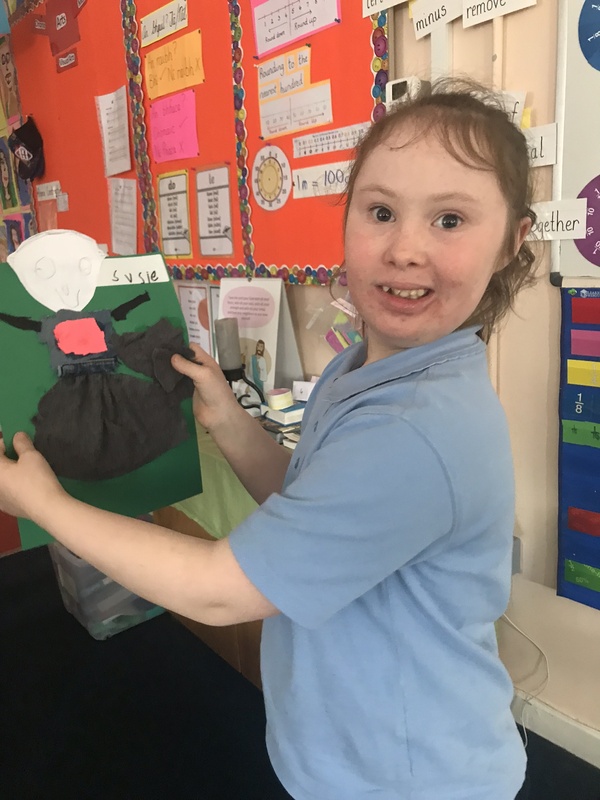 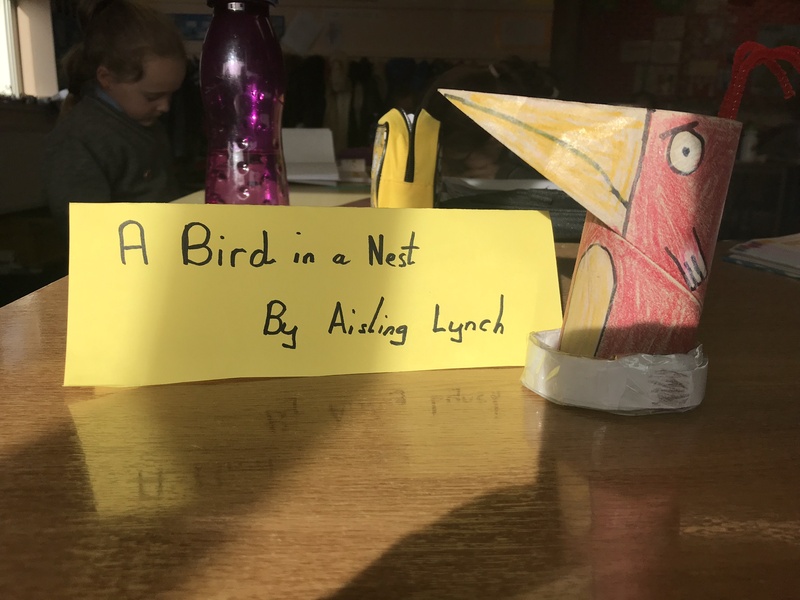 The children from Third Class also visited their “buddies” in junior Infants to show them their creations. 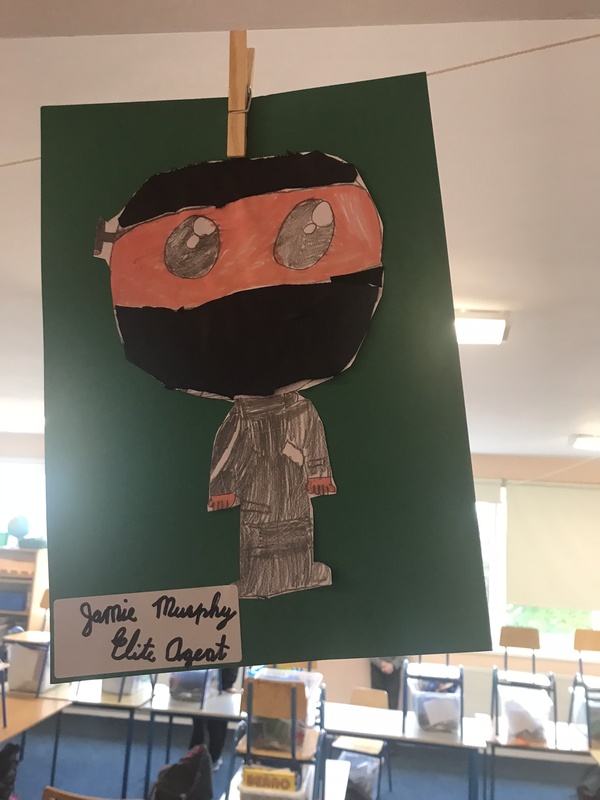 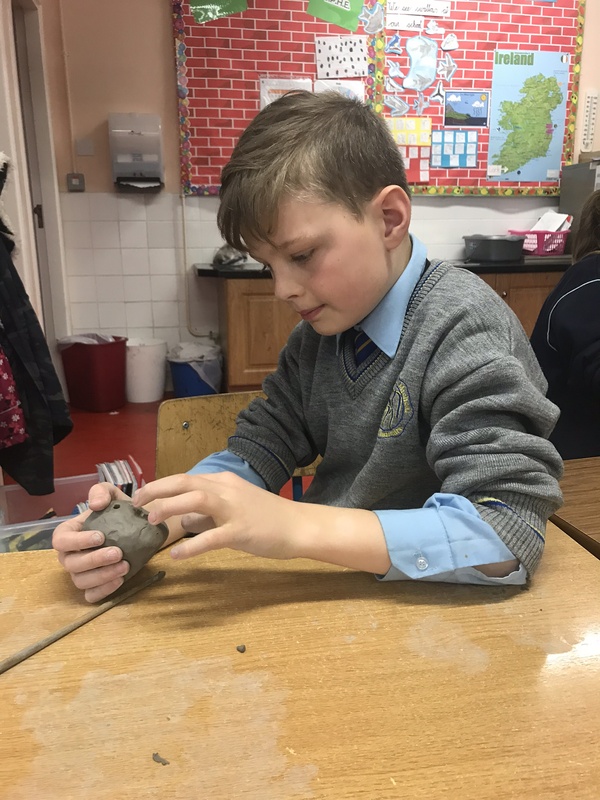 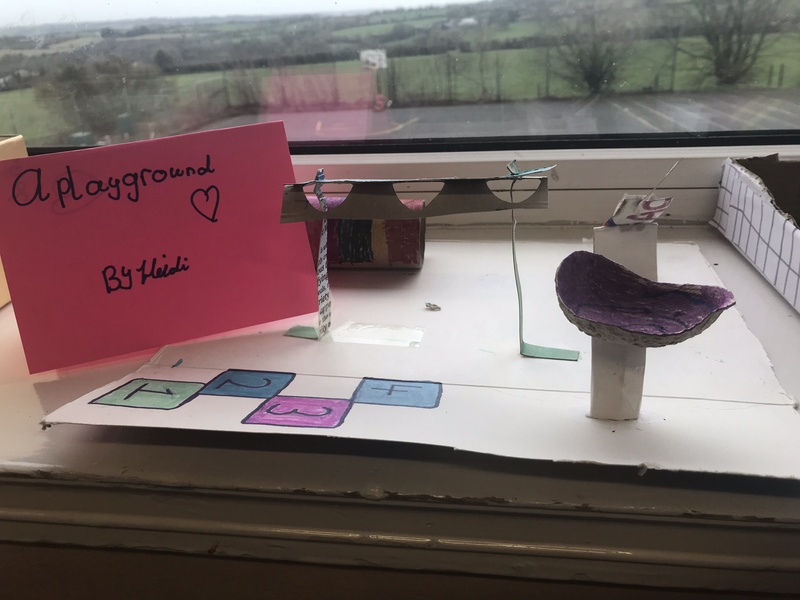 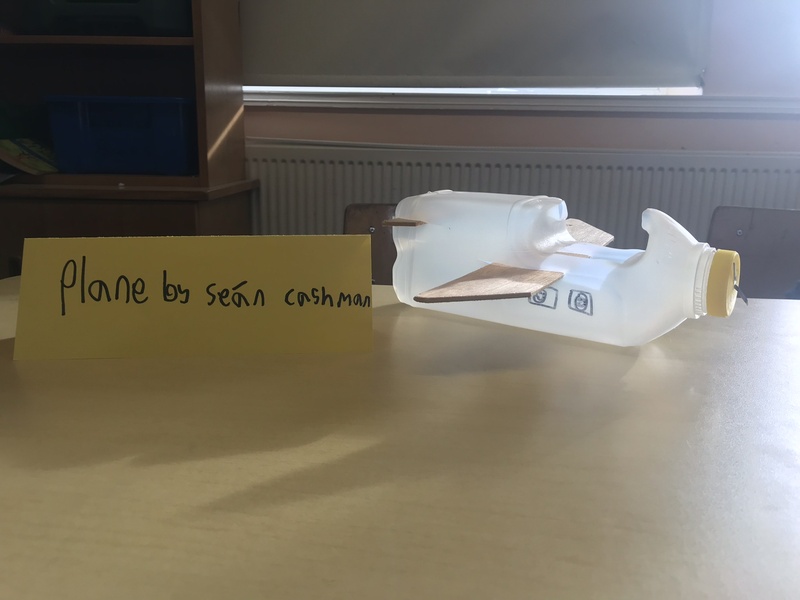 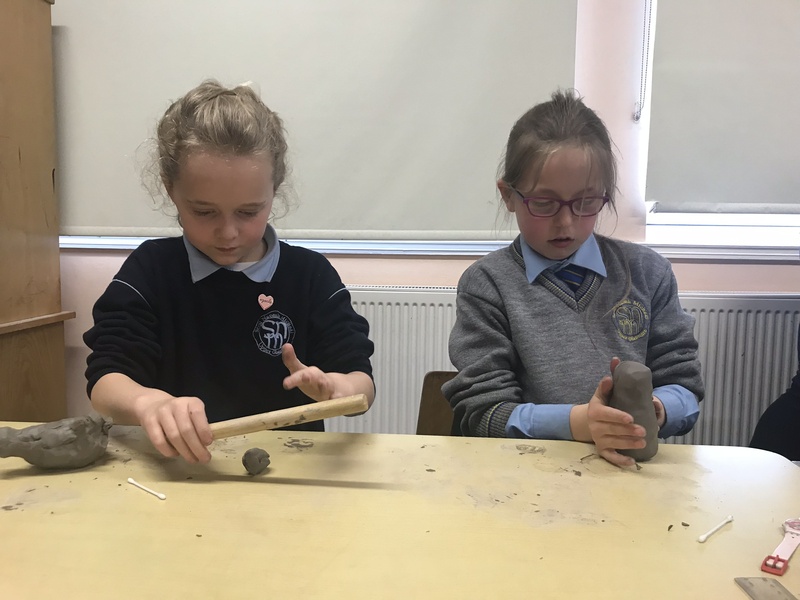 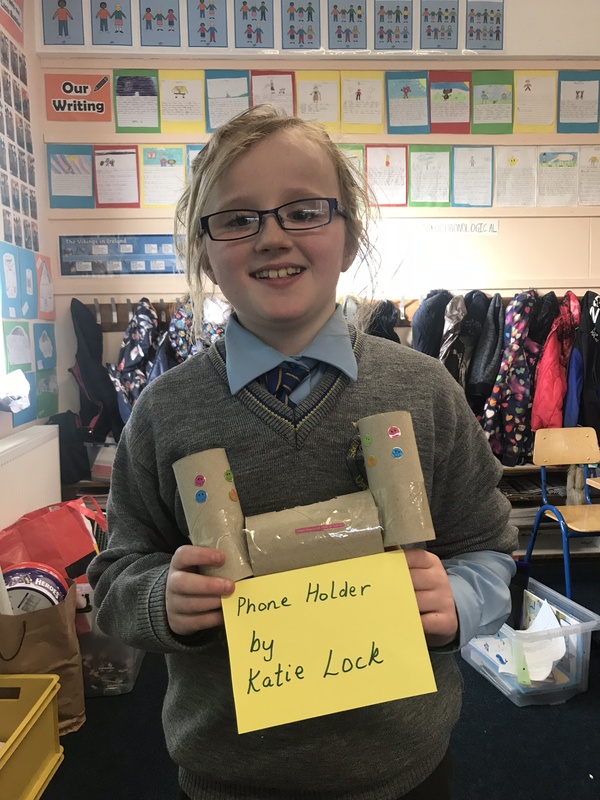 As Junior Infants were working on “Junk Art” construction as part of their Aistear programme at the same time, they found it useful to listen to the older children describe the materials they had used and how they solved problems relating to balance and aesthetics during the process. 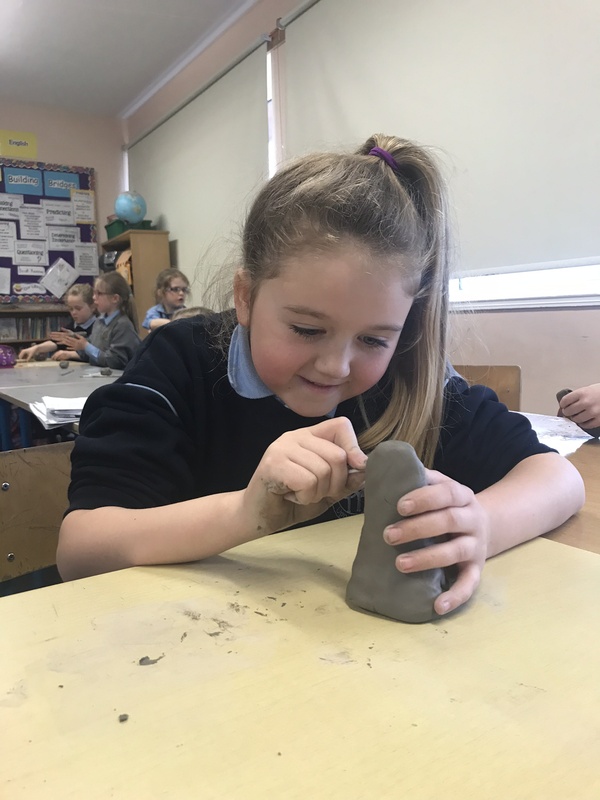 During February and March, we explored the Clay Strand of the Visual Arts curriculum. 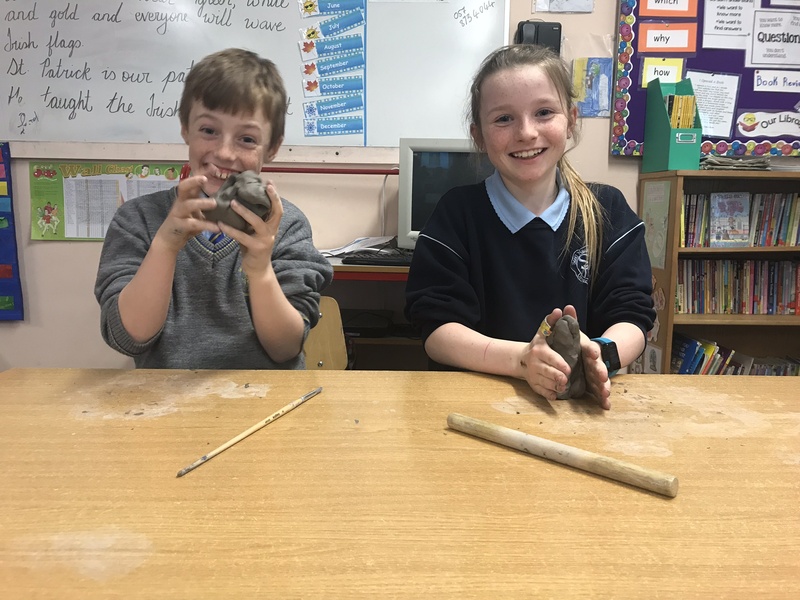 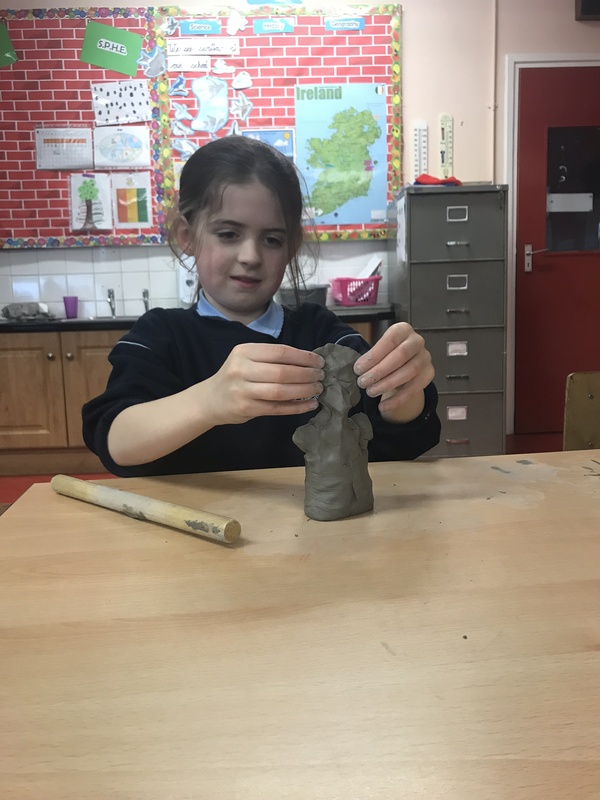 The children began by experimenting with the clay and getting a feel for the medium. 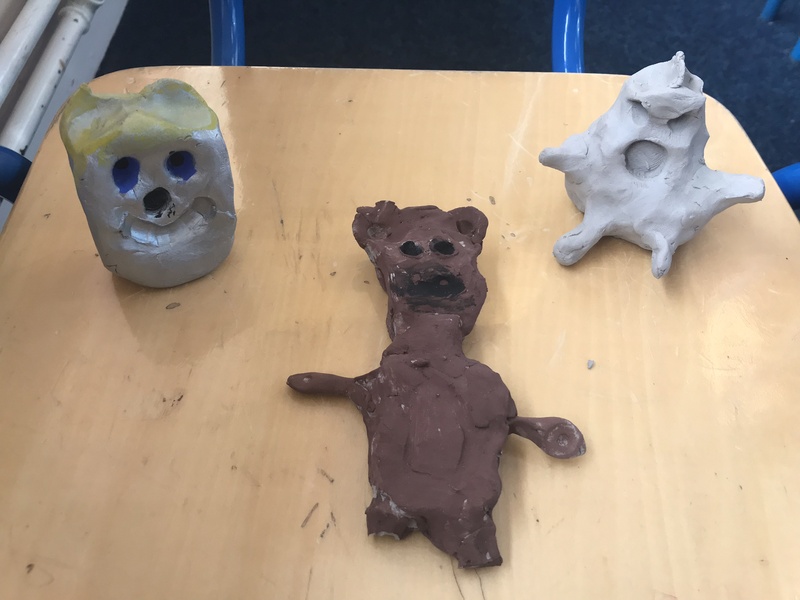 The objective in the first week was not to create a finished product but to explore the characteristics of the clay and talk about it. 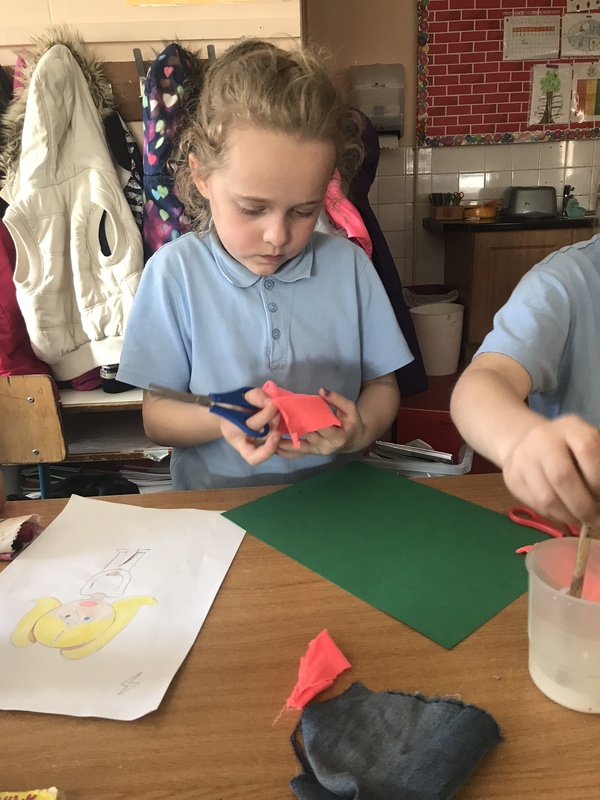 We then took a look at the work of some artists. 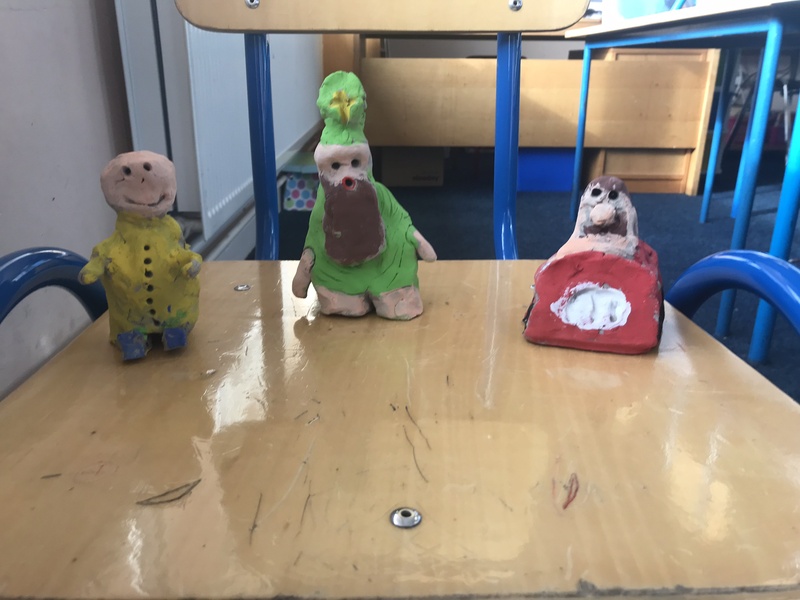 We looked at pictures of Donatello’s Habakkuk and Rodin’s pieces Balzac and The Burghers of Calais. 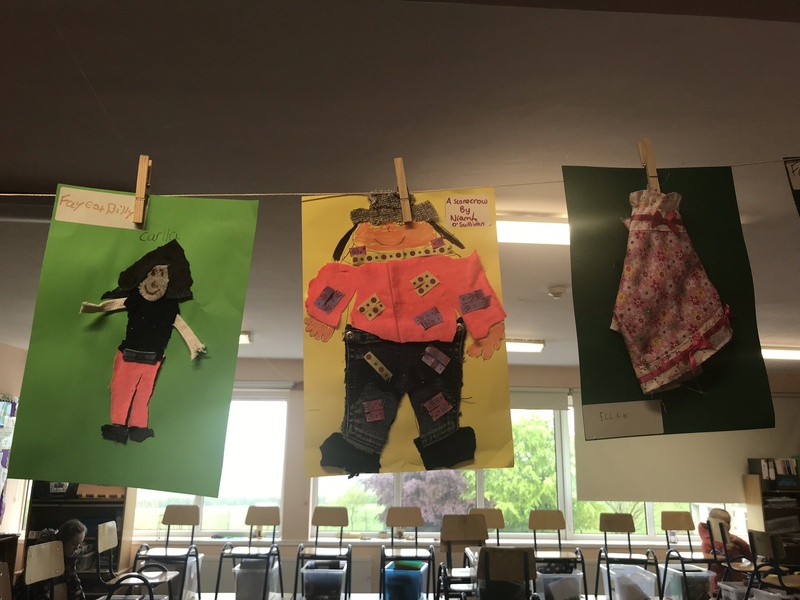 We compared these to Giacometti’s tall, extremely linear figures. 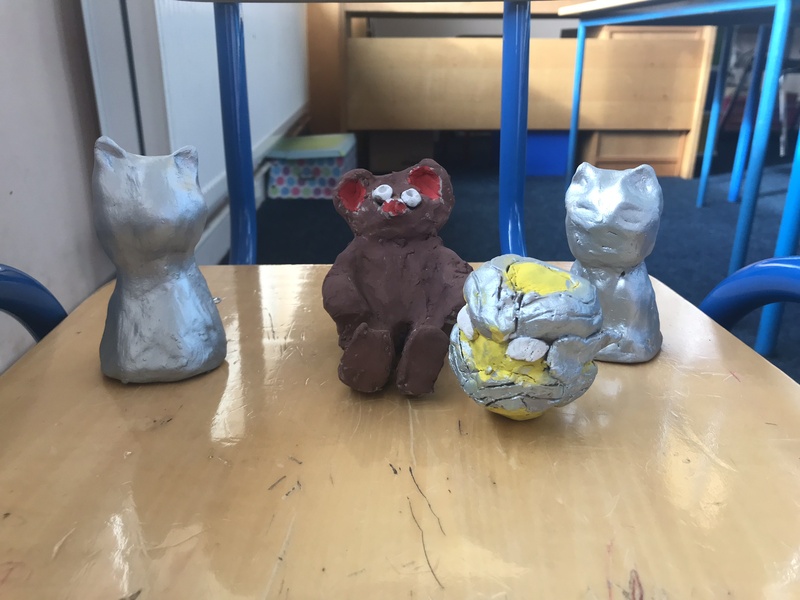 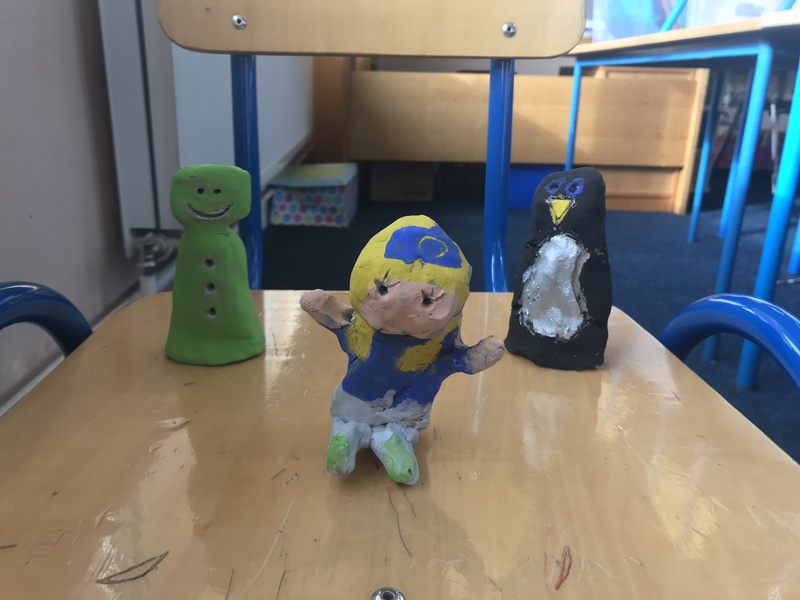 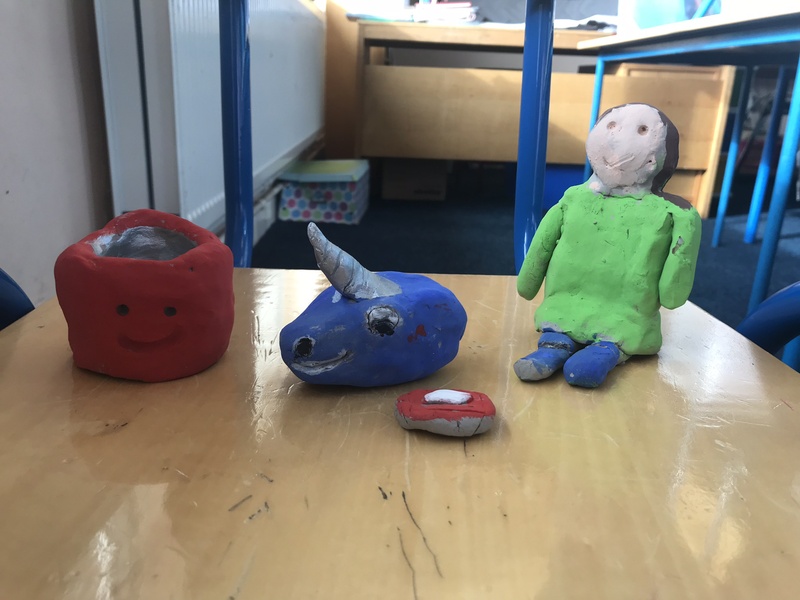 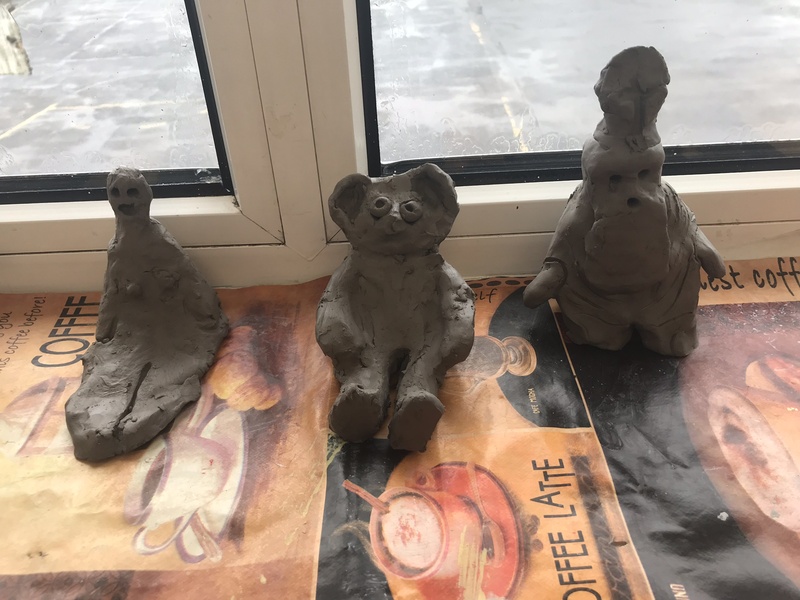 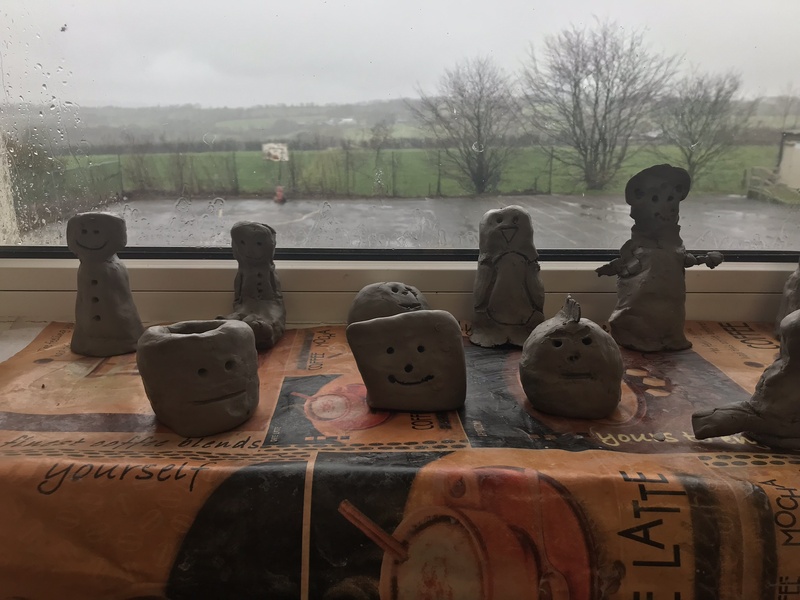 We also talked a little bit about the children’s previous experiences with clay and what had worked best for them in the past when working with it. 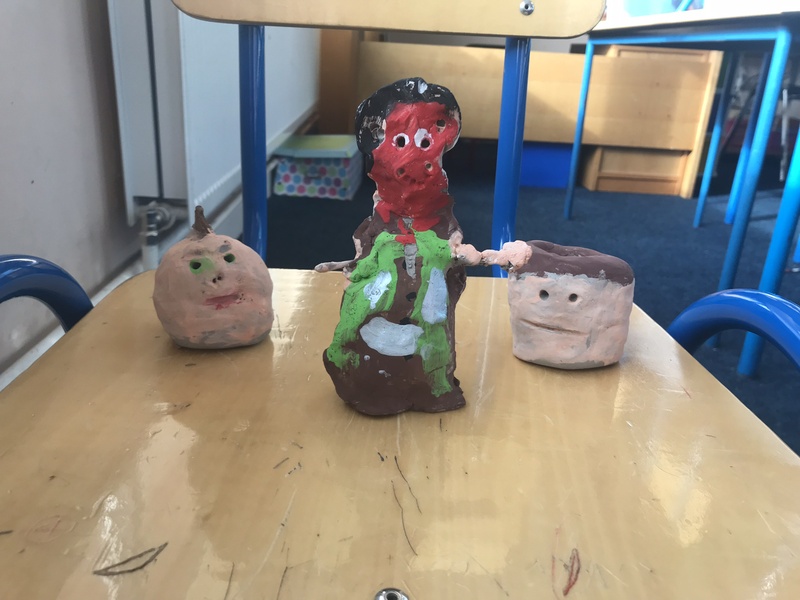 all sides as it progressed. 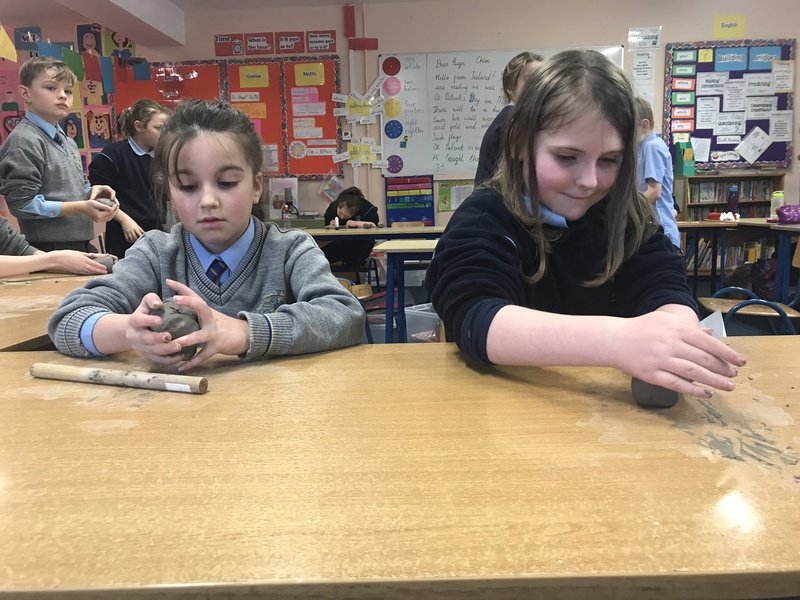 The following week, when the clay had dried, it was time to finish the pieces by painting them with a mix of paint and PVA glue. 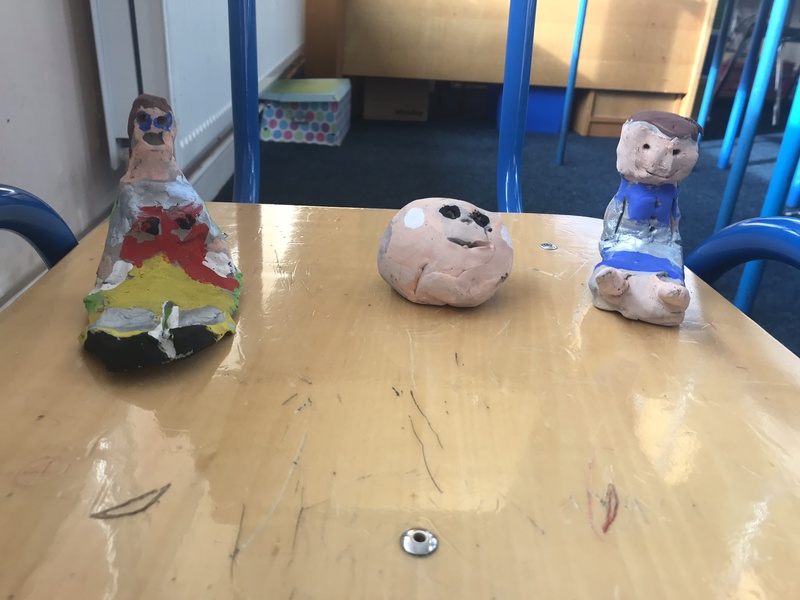 The process was very enjoyable for all and resulted in some great works of art as can be seen in the photos below. 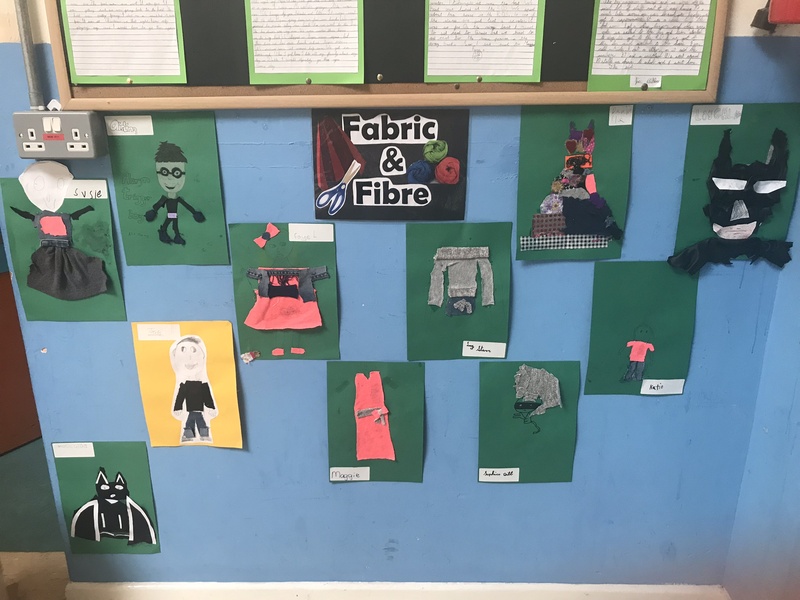 We worked on the Fabric and Fibre strand throughout April and May. 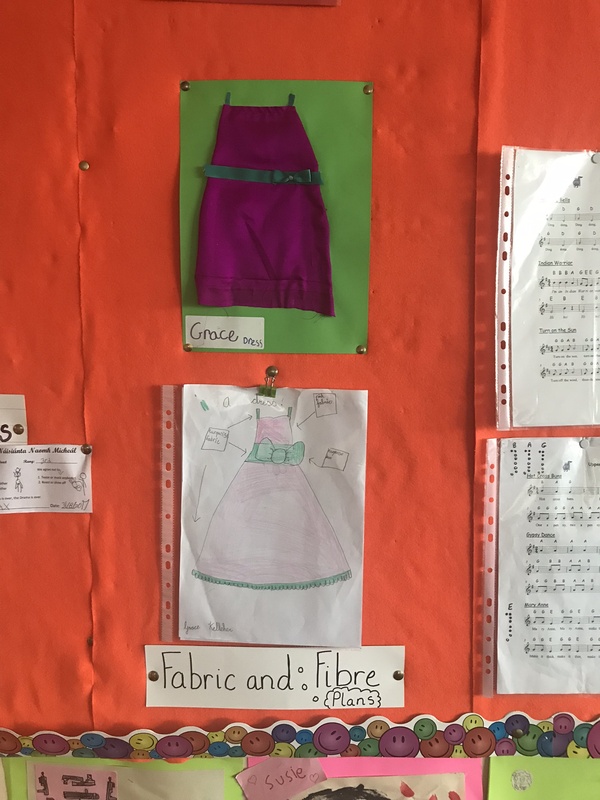 The children collected and sorted pieces of fabric, ribbon and wool of various textures and patterns. 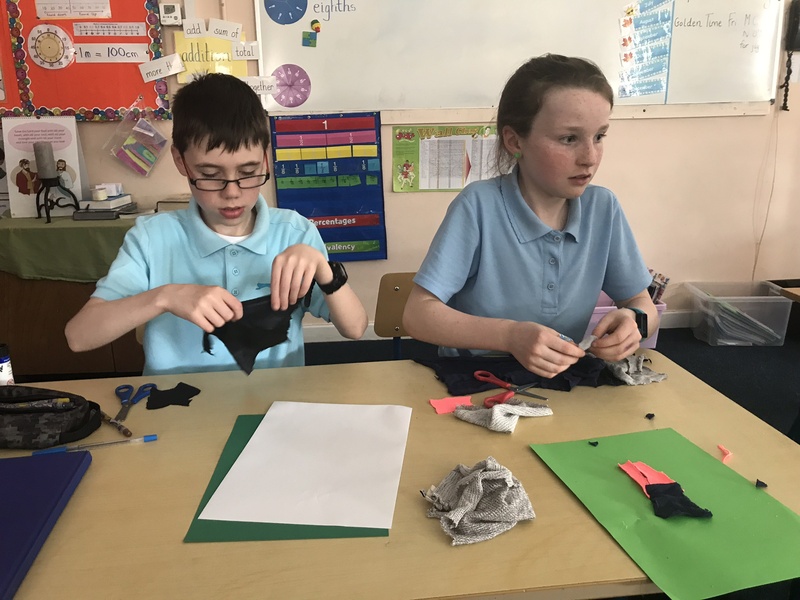 They then created plans of the costume designs that they would like to create. 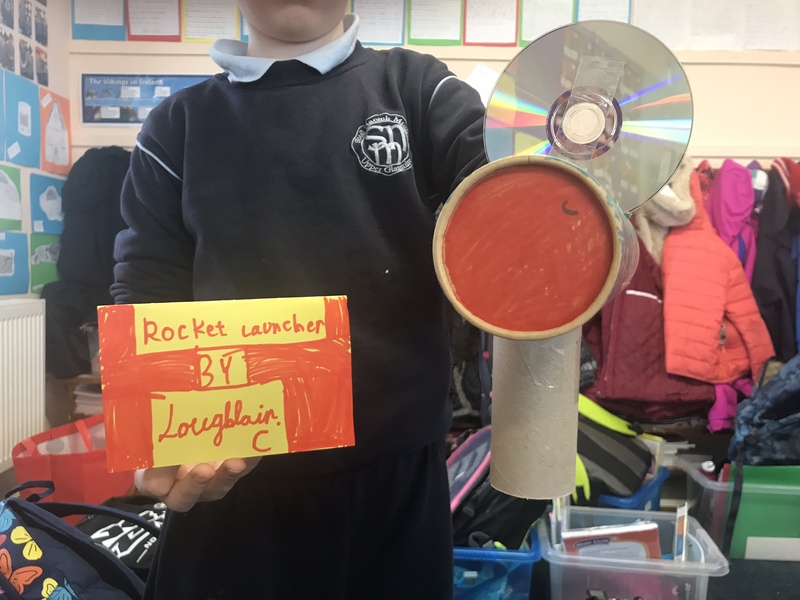 They had to consider what materials were available and which of these would be most effective. 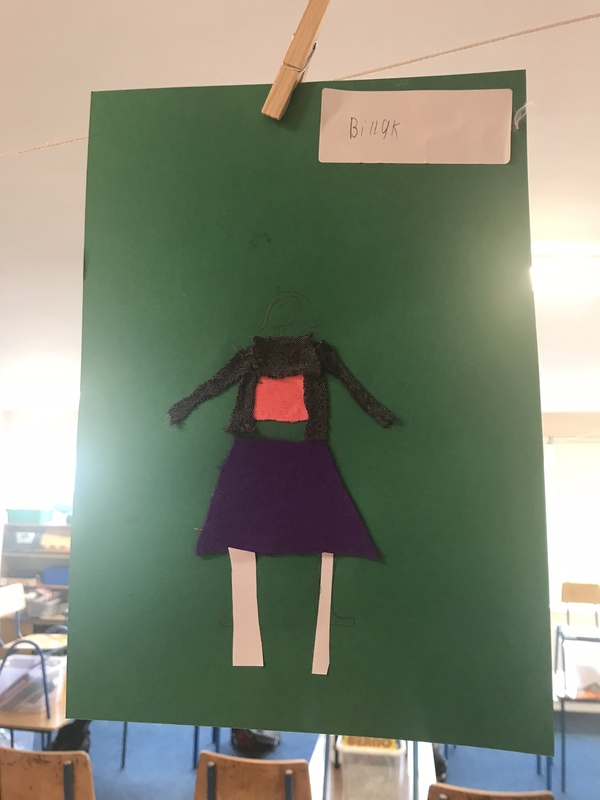 The next step was to create their costumes on card. 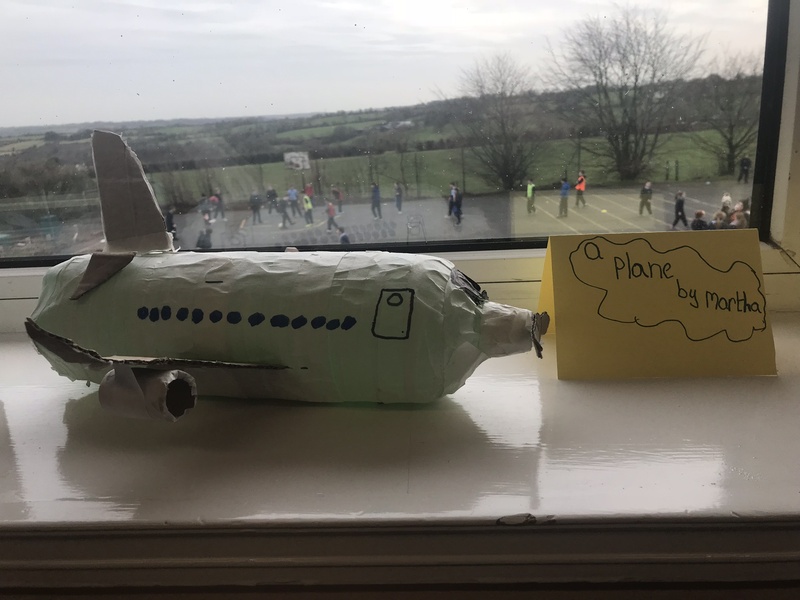 Some children found that they had to revise their plans. 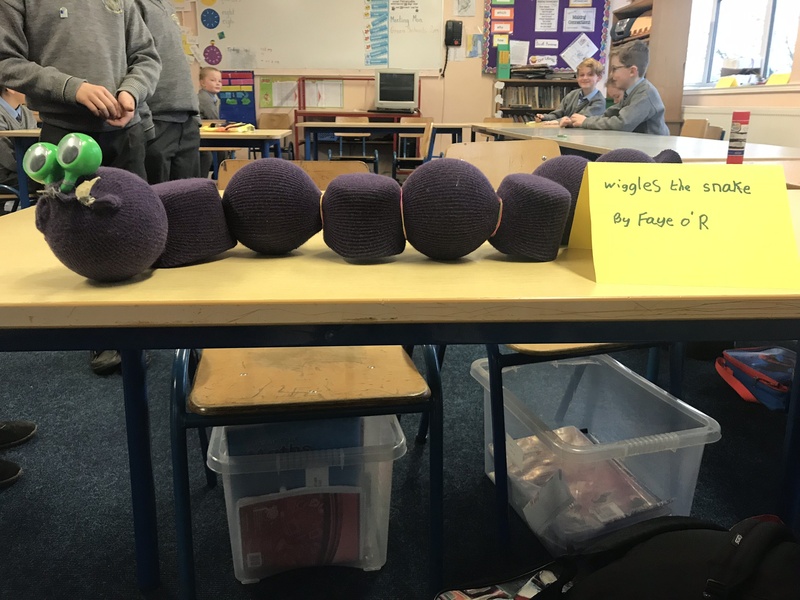 Some children followed their design exactly. 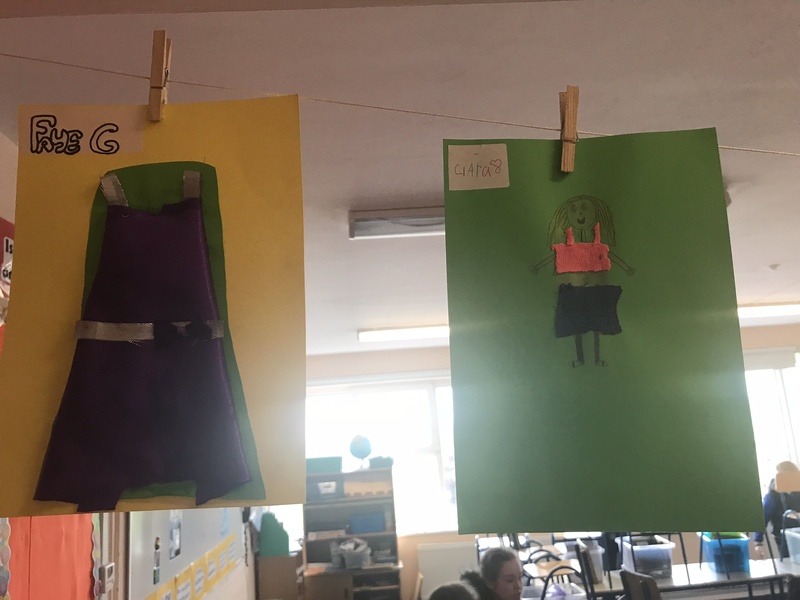 The finished designs were displayed in the classroom and in the school hall and the children gave each other feedback on their work.